We have been on a watermelon kick here lately and so I just had to make some Fresh Watermelon Lemonade to quench our thirst in this heat. Y'all this stuff is so good. The watermelon is undoubtedly the most favorite of the summer melons. There are four main varieties of watermelon: all sweet, ice-box, seedless, and yellow flesh. Watermelons vary in taste and color depending on the variety, the soil and the climate they're grown in. The outside of a watermelon can vary from light to very dark green. It can be solid to mottled green or striped. The inside flesh can be dark red to bright red to reddish pink, with many variations, including melons with yellow flesh. Most watermelons have seeds but there are also seedless varieties. Some think that seeds are part of the fun of eating a watermelon while others prefer seedless varieties which are easier to eat. They also require less prep time when using them in a fruit salad or other recipes. Choosing a watermelon at the peak of perfection requires some skill. I will be the first to admit, I don't always remember how to pick a ripe one. First, look for one that's firm and free of bruises. A ripe watermelon will feel heavy for its size. Melons are 90% water so the ones that seem heavy for the size are going to be the juiciest watermelons. When a watermelon is ripe, the spot where it laid on the ground while growing will be a creamy yellow color rather than white or pale green. Thumping a ripe watermelon with your finger will produce a rather dull, hollow tone. Thumping an un-ripened melon will create a clear tinging sound. Though watermelons must be chilled before eating for that mouth-watering refreshing taste, if you're short on refrigerator space, whole melons will keep at room temperature for about 7 to 10 days. (I have the smallest refrigerator on the planet) After the watermelon is cut, store it in the refrigerator. They are not freezer friendly because they become mushy and lose their flavor. They are full of vitamin C and they're also a good source of vitamin A, potassium and fiber. Also, they contain high amounts of lycopene, a substance that can prevent heart diseases and some cancers, and that is something we could all be happy about. 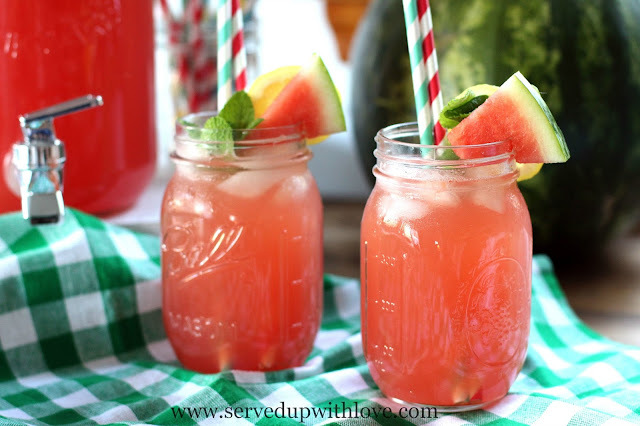 So to make this Fresh Watermelon Lemonade I went with my trusty Lemonade recipe as a base and added the watermelon. Cube up the watermelon and pulse it in a blender until smooth. (of course you want to use the seedless watermelon) Then, pour it through a fine mesh strainer to remove any stray seeds or thick pulp. 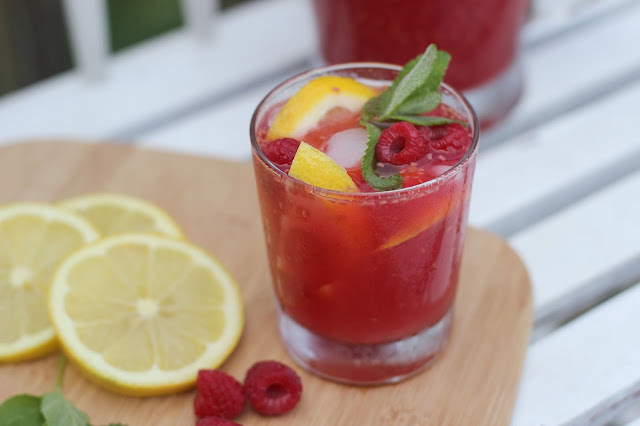 Pour into the lemonade and stir. I did find that the watermelon will separate from the lemonade as it sits. Just stir it up and its good to go. 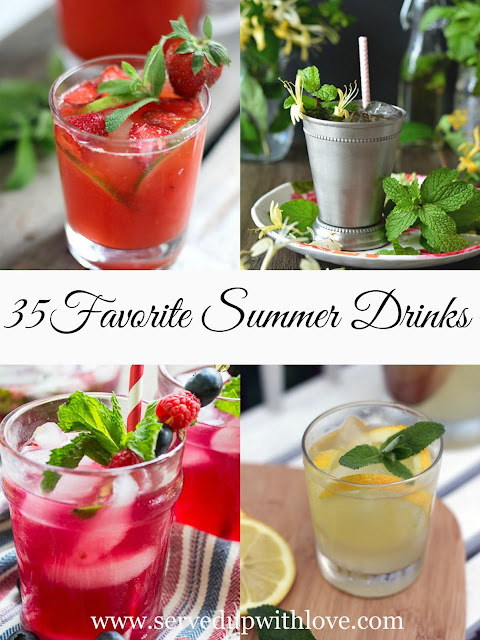 Trust me y'all, this will quench your thirst on a hot summer day! Make simple syrup by heating the sugar and water in a small saucepan until the sugar is dissolved completely. Set aside to cool. 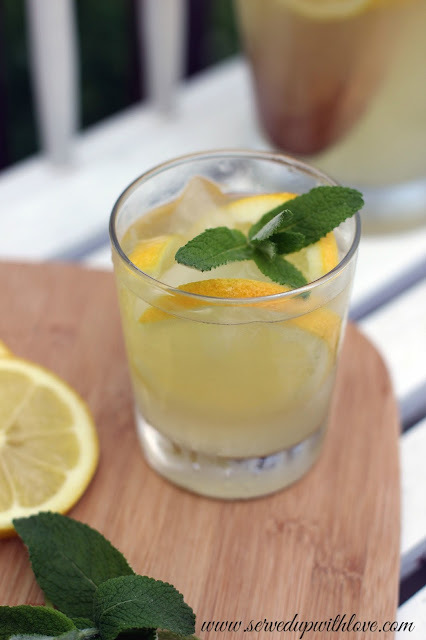 While the simple syrup is cooling, use a juicer to extract the juice from 4 to 6 lemons, enough for one cup of juice. Add the juice and the simple syrup to a pitcher. 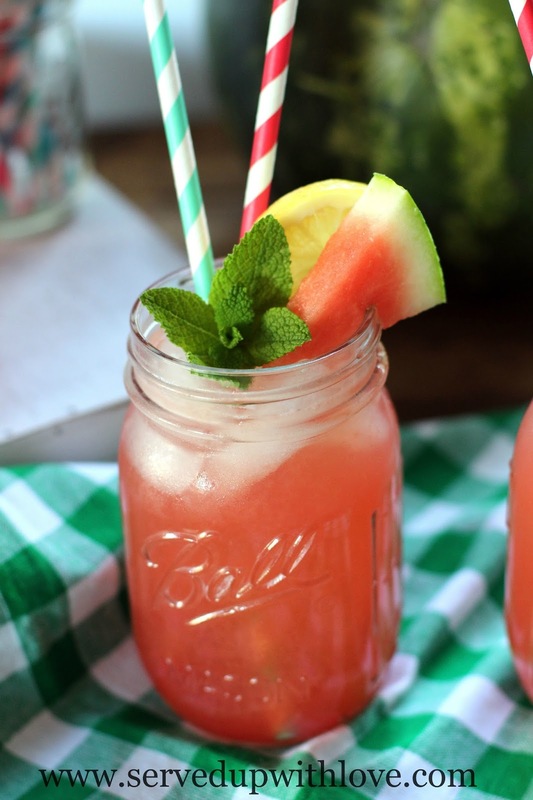 Place the cubed watermelon in a blender and blend until smooth. Pour through a fine mesh strainer to remove any seeds or thick pulp. Stir into the pitcher. Add 3 to 4 cups of cold water, more or less to the desired strength. Refrigerate 30 to 40 minutes. 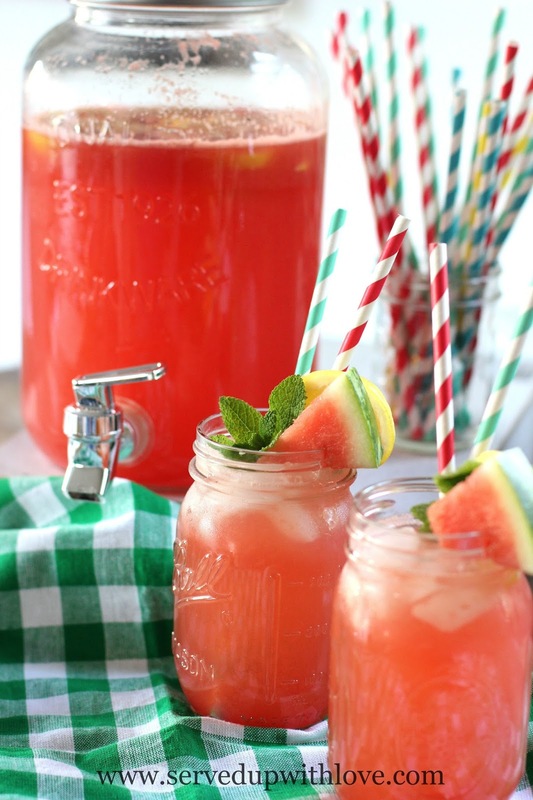 I am going to have to just stop and make some of this watermelon lemonade. When we get watermelons, we always eat them up and there is none left to make a watermelon drink. I became fond of watermelon juice on a mission trip one summer. I hope you get to make it soon. 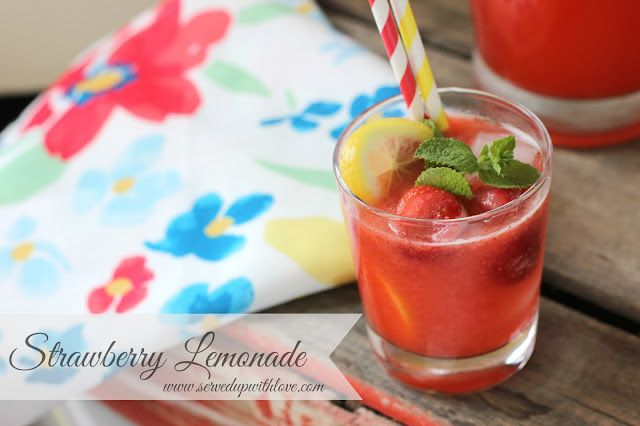 Watermelon is my favorite fruit during the summer and this lemonade is super refreshing!